The Bereliani Law Firm is a full service law firm. We represent businesses and consumers throughout California. Our areas of practice include Chapter 7 and 13 Bankruptcy, debt settlement, creditor abuse and other alternatives to bankruptcy. 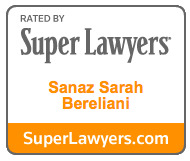 Our firm is committed to providing our clients with the superior legal services they require. We strive to give each client, whether an individual or a big corporation, the personal attention they deserve. We are driven by the desire to provide the optimum results for each of our clients. At the Bereliani Law Firm, our philosophy is to strive to reach a positive outcome for each client’s financial and legal matters by implementing practical and effective representation. We place our client’s needs and goals at the top of our priorities. We realize that this is a frustrating and stressful time in your life. The more answers you have, the better you understand the process, the less stress you will have. We pride ourselves on our communication. Our approach is to provide the most reasonable prices for our services without sacrificing the quality of our representation. The attorneys at the Bereliani Law Firm have a keen understanding of the law, as well as an astute financial background. We will work hard to get you the results that you need and deserve. Let us provide you with the legal or financial assistance that you need to address your financial matters. If you would like to discuss your financial issues with one of our attorneys, please contact us today. To schedule a free initial consultation, please call (818) 920-8352.